1 dozen (12) 42" Texas Rigged Decoy weight system. Including the D-Ring and Heavy Duty Clasps. Rig your set with the easiest system to deploy and pick up. 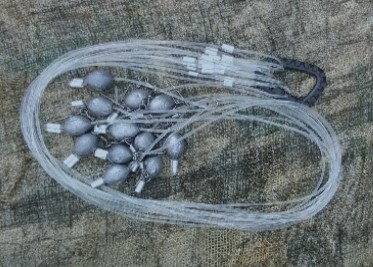 These are designed for the sinker to stay at the bottom, and the decoy clasp slides. This makes pick-up much easier and cleaner. Don't settle for less than the best! As usual, the Rais~A~Ruckus Standard is to be no less than the best, These are handmade and designed for serious waterfowlers. Copyright Rais~A~Ruckus Game Calls. All Rights Reserved. eCommerce Software by 3dcart.